Injured due to an electric shock at work? Many electrical faults are caused because of faulty equipment or because of a responsible party’s breach of their legal duty of care. Electric shocks can cause significant physical and psychological damage, and victims are legally entitled to claim compensation for their losses and suffering. Our solicitors have managed compensation claims for a multitude of electric shock victims and are skilled in demonstrating liability and severity of symptoms to secure the highest settlement awards. The following guide provides information for anybody who has suffered an electric shock, no matter how severe, and how they can access the compensation that it rightfully theirs. What are the symptoms of an electric shock injury? Subsequent injuries caused as a result of the electric shock throwing the victim into another object or onto the ground. In the most serious cases, the electric shock can prove to be fatal, which is referred to as electrocution. As well as the physical symptoms that are presented to us, many of our clients have suffered psychological or emotional injuries as a result of the electric shock. Whether the shock has caused anxiety, confidence issues, Post Traumatic Stress Disorder (PTSD) or emotional stresses brought on by the inability to work or perform daily tasks because of the shock injury, the psychological impact can be significant. We are committed to securing compensation for all of your losses and physical and emotional suffering. How can it be proved that somebody else was liable? It is unreasonable for anybody to suffer physical or emotional damage following an electric shock caused by somebody else and so compensation can be claimed for a number of causes. It is the job of your solicitor to demonstrate who was liable for your injuries and make them accountable for the breach of the duty of care that they owed to you. In each of the above settings, others are legally responsible for ensuring the environment is free from risk and that adequate protection is offered to others. If this legal duty has been breached, you will be able to claim personal injury compensation for your pain and any any financial losses incurred as a result. 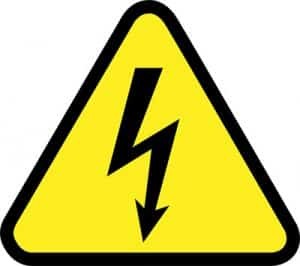 There are a number of potential causes for electric shocks in a work environment, and employers are legally required to follow the guidelines set out in the Health and Safety at Work Act 1974. This means that the employer must carry out regular risk assessments, make provisions for any dangers found, and any worker who is at risk of suffering from electric shocks should be provided with suitable Personal Protection Equipment (PPE) by their employer. Malfunctioning personal care products including hair dryers and electric razors. Further risks can be caused by faulty maintenance work to property, and we have processed claims from homeowners who have suffered electric shock injuries after negligent building work in their home. Errors in electrical wiring can cause serious and sometimes fatal damage to a person, and the electrical engineer can be held accountable for their dangerous and negligent work. Poor maintenance and substandard electrical wiring can cause severe electric shocks to people whilst on holiday. A hotel has a legal duty of care to its guests, and if you booked your holiday as a package deal with an ATOL registered company, you could be eligible to make an electric shock injury compensation claim under the Package Travel Regulations 1992. Owners of any public space such as a shopping centre, leisure facility, entertainment venue or public toilets have a legal obligation to provide a safe and risk free environment for visitors. If you have suffered an electric shock because of a fault in equipment, building construction or facilities in a public space, you will be eligible to make a claim for compensation. The owners of these spaces are legally required to hold public liability insurance, and this ensures that they are covered in the event of anybody suffering an illness, injury or other loss in their setting. Our solicitors take great care to fully understand the level of suffering caused to you by the electric shock, and we are committed to demonstrating the severity of your symptoms to secure the highest award amounts possible. We offer all clients a free initial consultation, which allows us to assess your case and answer any questions that you may have about your claim. Once we have evaluated the information that you provide, we will offer a realistic estimate of the likely compensation amount that may be awarded to you.